To Cite: Ahmadi S, Awliaei H, Haidarizadeh M, Rostamzadeh J. The Effect of Ethanolic Extract of Urtica dioica Leaves on High Levels of Blood Glucose and Gene Expression of Glucose Transporter 2 (Glut2) in Liver of Alloxan-Induced Diabetic Mice, Gene Cell Tissue. 2015 ; 2(3):e30355. doi: 10.17795/gct-30355. Background: Urtica dioica L. (stinging nettle) has been accepted for decreasing blood glucose levels; however, the exact mechanism of its anti-hyperglycemic effect remains to be understood. Objectives: We aimed to examine the effects of ethanolic extract of stinging nettle leaves on blood glucose levels and gene expression of Glucose Transporter 2 (Glut2) in liver of alloxan-induced diabetic mice. Materials and Methods: Twenty-four male Naval medical research institute (NMRI) mice were randomly divided to three groups. The control group received saline (10 mL/kg, intraperitoneally) for eight days, the diabetic group received three days of injections of alloxan (200 mg/kg, intraperitoneally) followed by five days of injections of ethanol (20%), and the diabetic + nettle extract group received alloxan for three days followed by five days of injections of the nettle extract (150 mg/kg). Mice were weighed before and after treatments (on days one and nine). On day nine, mice were sacrificed, blood samples were collected for measuring glucose levels and liver was dissected to examine changes in the Glut2 gene expression with the semi-quantitative reverse-transcription-polymerase chain reaction (RT-PCR) method. Results: The results showed that the nettle extract significantly decreased high levels of blood glucose (P < 0.001). The nettle extract also had a preventive effect on decrease in body weight. In addition, the results showed that the Glut2 gene expression was increased in liver of diabetic mice (P < 0.05) and was significantly prevented by the nettle extract in diabetic + nettle extract group (P < 0.05). Conclusions: It can be concluded that the nettle extract can reduce blood glucose levels in diabetic mice, at least partly, by influencing the Glut2 gene expression in mice liver. Diabetes mellitus is the most common metabolic disorder worldwide that has not been fully controlled (1-3). Medicinal Plants are highly accepted options for treatment of diabetes in some countries (4). Urtica dioica L. (stinging nettle) has been accepted in traditional herbal pharmacy for decreasing blood glucose levels in patients with diabetes in some countries including Iran and Turkey (4, 5). In addition to its anti-hyperglycemic effect, some other effects including anti-hyperlipidemia, antioxidant, anti-inflammatory and anti-cancer have been reported for nettle (6-8). According to previous researches, nettle extract may decrease blood glucose via increasing insulin secretion in diabetic rats (5). However, the exact mechanisms of anti-hyperglycemic actions of stinging nettle remain to be elucidated. Glucose transporter 2 (GLUT2) is a membrane protein that facilitates the transport of glucose over a plasma membrane (9). Expression of the GLUT2 protein has been reported in cell membranes of the liver, pancreas, small intestine and to a lesser extent brain and kidney tissues (9). It has been shown that the GLUT2 is the major glucose transporter in the plasma membrane of hepatocytes for glucose uptake. This protein is also involved in the second step of trans-epithelial glucose transport in the small intestine and the proximal convoluted tubule of kidneys (9). Alloxan is a glucose analogue that accumulates in beta cells through uptake via the GLUT2, and induces diabetes in laboratory animals (10). It has been reported that alloxan generates reactive oxygen species that finally result in beta cell death (11). In addition, alloxan inhibits glucose-induced insulin secretion via inhibition of glucokinase, the glucose sensor of beta cells (11, 12). According to previous researches, alloxan may also influence other organs like the kidneys and liver that express the GLUT2 transporter (11). It has been shown that GLUT2 expression is regulated at both mRNA and protein levels (9). It has been shown that expression of GLUT2 in hepatocytes has an important role in glucose homeostasis (13). A decrease of the Glut2 gene expression has been reported in pancreatic beta cells of mice and humans with diabetes, yet no changes were reported in the liver (13, 14). It was also reported that mRNA of GLUT2 are target molecules for alloxan in beta cells in an in vitro study (15). Therefore, it was logical to investigate possible changes in Glut2 gene expression at mRNA level in liver of alloxan-induced diabetic mice. The aim of this study was to evaluate the effect of the nettle leaves ethanolic extract on blood glucose levels in diabetic mice. We examined possible changes in Glut2 gene expression in liver of alloxan-induced diabetic mice. First, a mice model of diabetes was established by injection of alloxan monohydrate during a regimen of three days followed by five days spent drug-free. Second, effects of ethanolic extract of stinging nettle leaves on body weight, blood glucose level, and Glut2 gene expression in the liver were evaluated. Adult male albino Naval medical research institute (NMRI) mice weighing 25 - 30 gr were used. The animals were kept under a 12-hour light/dark cycle (light on at 7:00 am) and controlled temperature (22 ± 2°C). They were housed in groups of eight per cage with free access to food and water. Each animal was used only once. All procedures were performed in accordance with the guidelines for care and use of laboratory animals (2011), prepared by the national academy of sciences’ institute for laboratory animal research. Alloxan monohydrate was purchased from Sigma (St. Louis, MO, USA). Urtica dioica L. (stinging nettle) was collected from areas around Sanandaj (Kurdistan, Iran), and the species of the plant was confirmed by the division of plant biology at the university of Kurdistan. Next, the nettle leaves were dried in a dark room, grinded and 15 g of the powder was soaked in 100 mL of ethanol (70%) for 24 hours in a dark container away from light. The solution was mixed repeatedly during extraction with a stirrer and filtered after 24 hours. The filtrate was submitted to a rotary evaporator (Heidolph, Germany) to obtain a dried extract. Next, 150 mg of the nettle leaves extract was dissolved in 10 mL of 20% ethanol diluted by saline, to obtain a final concentration of 150 mg/10 mL. Twenty-four male NMRI mice were divided to three groups of control, diabetic, and diabetic + nettle extract. During treatments, each mouse received a daily injection of either saline, alloxan (200 mg/kg), ethanol (20%) or previously prepared nettle extract (150 mg/kg) intraperitoneally, at a volume of 10 mL/kg, according to the following regimen. The control group only received saline treatment for eight days. The animals in the diabetic group received three days of injections of alloxan (200 mg/kg) followed by five days of injections of ethanol (20%), as the solvent of the nettle extract. 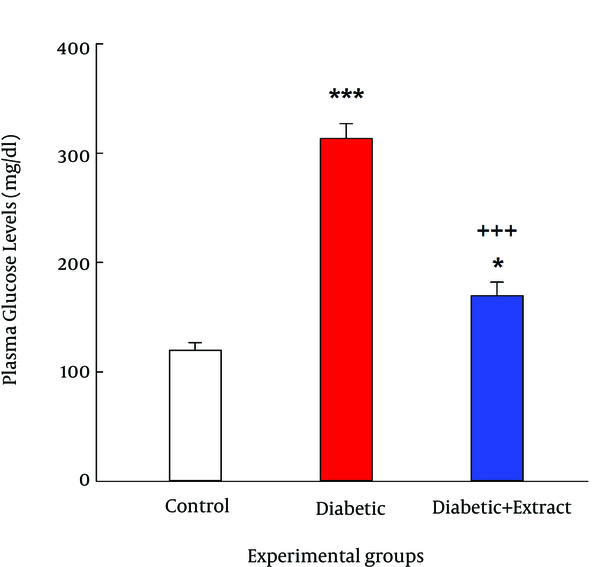 Mice in the diabetic + nettle extract group received alloxan for three days followed by five days of injections of the nettle extract (150 mg/kg). On day nine, mice after 14 hours of fasting were deeply anaesthetized with a mixture of ketamine/xylazine (100 and 10 mg/kg, respectively). Blood samples were collected for measuring blood glucose levels, then the abdomen was dissected and a piece of liver was dissected for evaluating the Glut2 gene expression. After centrifugation, plasma was separated from blood samples and glucose measurement was performed with a glucose peroxidase assay kit (Pars Azmun Co, Tehran, Iran). Mice with blood glucose levels higher than 11.1 mmol/L (200 mg/dL) were considered as diabetic mice (16). The dissected tissue of the liver from each animal was moved along an ice-chilled sterile surface. A piece of liver was immediately transferred to a tube containing 400 μL of RNAlater. (RNA stabilization reagent Qiagen, USA), and incubation was followed at 4°C. Twenty-four hours later, the RNAlater solutions were aspirated from the tubes and the remaining tissues were stored at -80°C until further analysis. Total RNA was extracted from 70 mg of liver tissue of each animal using the Trizol method, according to the manufacture’s manual (RNX + reagent, Cinagen, Tehran, Iran). Quality of the total RNA was assessed by electrophoresis on 1% agarose gel to visualize 28 s and 18 s ribosomal RNA. The concentrations of the total RNAs were also measured with a spectrophotometer (Specord 210, Analytic Jena, Germany). A semi-quantitative reverse transcription-polymerase chain reaction (RT-PCR) method was used to assess the Glut2 gene expression. Reverse Transcription-reaction was performed using Viva 2-step RT-PCR Kit according to the manufacturer’s protocol (Vivantis, Selangor, Darul Ehsan, Malaysia). Polymerase Chain Reaction was used for amplification of the β-actin and Glut2 genes. The primers had the following sequences: the β-actin forward primer, 5′-CTGGGTATGGAATCCTGTGGC-3′; the β-actin reverse primer, 5′-AGGAGGAGCAATGATCTTGATC-3′; the Glut2 forward primer, 5′- CATTGGCACATCCTACTTG-3′; the Glut2 reverse primer, 5′-CACAAGCAGCACAGAGACA-3′. First, PCR optimizations were done to acquire conditions with a linear relationship between RNA concentration used for cDNA synthesis, the number of PCR cycles and the annealing temperature of primers relative to the PCR product. Thermal cycling was initiated with a denaturation step at 95°C for three minutes, followed by 26 cycles of thermal cycling at 94°C for 30 seconds, 59°C for 30 seconds, 72°C for 30 seconds, and finally 10 minutes of final extension step at 72°C, and termination at 4°C for five minutes (C1000 Thermal Cycler, BIO-RAD, USA). The PCR products were subsequently analyzed by electrophoresis on 2% agarose gel and bands related to the β-actin and Glut2 genes were quantified by densitometry using the Image J software. The quantified values for the Glut2 gene expression for each sample were normalized compared to the relative β-actin band. Then, the relative expression of the Glut2 gene was set at 100% in control group. The quantified values for the Glut2 gene expression in the other groups were normalized in the same way and compared to control group. Plasma glucose levels and gene expression data passed the normality and equal variance tests and were analyzed by One-way analysis of variance (ANOVA). After a significant F value, post hoc Tukey’s test was used for pairwise comparisons. The weighing data before and after treatments in each group were analyzed with paired T-test. P values of < 0.05 were considered statistically significant. Total body weight of animals in each group after treatments was compared to their weight before treatments. Analysis of data with paired T-test showed a significant increase in body weight of the control group (P < 0.01) yet it was decreased in diabetic (P < 0.01) and diabetic + nettle extract groups (P < 0.05) (Figure 1). Each bar represents mean ± standard error of the mean (SEM) of the total body weight in each experimental group (n = 8). **P < 0.01, + + P < 0.01 and # P < 0.05 compared to weight of the same group before treatments. The results showed that plasma glucose levels in the experimental groups (control, diabetic and diabetic + extract) were significantly altered after treatments (F (2, 21) = 79.46, P < 0.001). The average plasma glucose level was greater than 300 mg/dL in the diabetic group, which was significantly higher compared to the control group (P < 0.001). Although plasma glucose level in the diabetic + extract group was significantly higher compared to the control group (P < 0.05) yet was significantly lower compared to the diabetic group (Figure 2). 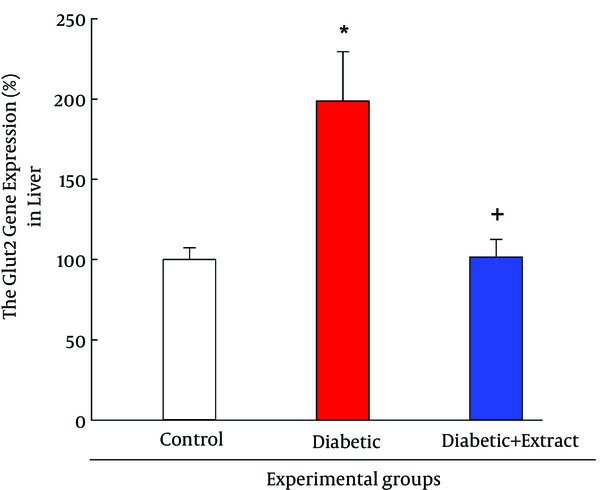 Each bar represents mean ± SEM of blood glucose levels in each experimental group (n = 8). ***P < 0.001 and *P < 0.05 compared to the control group. + + + P < 0.001 compared to the diabetic group. The gene expression data showed significant differences in Glut2 gene expression between the three experimental groups (F (2, 9) = 8.49, P < 0.01). Post hoc test showed that the Glut2 gene expression in the liver of the diabetic group was significantly increased (P < 0.05) compared to the control group. Post hoc test also revealed that the Glut2 gene expression in the liver of diabetic + extract group was significantly decreased (P < 0.05) compared to the diabetic group (Figure 3). These results suggest that the nettle extract decreased the high levels of Glut2 gene expression in mice liver. Each bar represents mean ± SEM of Glut2 gene expression normalized to β-actin in each experimental group (n = 4). Mean of the Glut2 gene expression was set as 100% in control group. *P < 0.05 compared to the control group, and + P < 0.05 compared to the diabetic group. The results of the present study revealed that mice with a regimen of three days of injection of alloxan followed by five days spent drug-free had fasting plasma glucose levels higher than 11.1 mmol/L (200 mg/dL), indicating induction of diabetes in the animals. Our results also showed that five days of injection of the ethanolic extract of nettle leaves, immediately after three days of injections of alloxan, significantly decreased blood glucose levels compared to the diabetic group. Although the blood glucose level in diabetic + nettle extract group was significantly higher compared to the control group yet the hypoglycemic effect of the extract of stinging nettle was partly confirmed. This result may support the efficacy of the nettle extract to diminish the increased levels of plasma glucose in diabetic mice. It has been reported that nettle extract decreases absorption of glucose in the intestine and lowers high levels of glucose in oral glucose tolerance test yet has no hypoglycemic effect in alloxan-induced diabetic rats (6). Other investigators have reported that alcoholic and aqueous extracts of dried nettle leaf can cause suitable repair of pancreatic tissue in an experimental model of diabetes induced by streptozotocin (17). According to previous researches, anti-hyperglycemic effects of nettle extract may be mediated through its actions on different parts of the body including the intestine and pancreatic beta cells. However, it is possible that discrepant reported results may be due to different species and chemicals used for induction of diabetes and/or intensity of induction of diabetes involved in different studies. 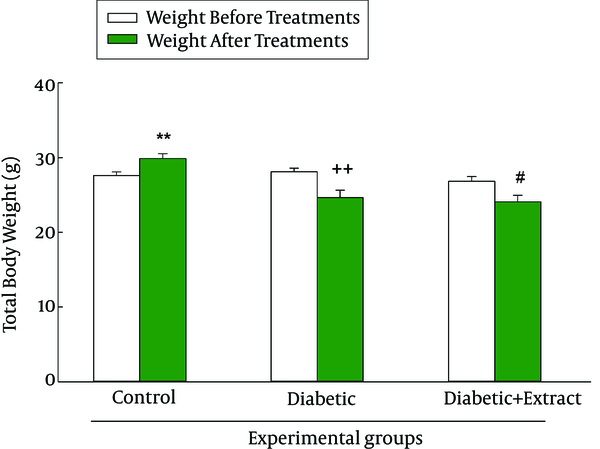 Comparing body weight of animals in experimental groups before and after treatments revealed that total body weight in the control group was increased yet it was decreased in the diabetic and diabetic + nettle extract group. However, the decrease of the body weight of the diabetic group was slightly more compared to diabetic + nettle extract group. This latter result may imply that the nettle extract, by its hypoglycemic effect, may prevent the decrease of body weight. However, the exact mechanism of this process has not been identified completely. It has been reported that alloxan affects not only pancreatic beta cells but also kidney and liver that express the GLUT2 transporter (11). The results of the present experiments showed that the Glut2 gene expression at mRNA level was increased in diabetic mice. According to previous researches, GLUT2 is the major glucose transporter in hepatocytes and it is required for glucose uptake yet dispensable for glucose output (9). Therefore, one may propose that the increased levels of blood glucose in diabetic mice had caused hepatocytes to increase GLUT2 transporter expression at the mRNA level. In support of changes in the Glut2 gene expression, it has been shown that GLUT2 expression is regulated at both the mRNA and protein levels (9). According to the results of an in vitro study, GLUT2 is a target molecule for alloxan in pancreatic beta cells (15). Therefore, one possible mechanism of alloxan to induce diabetes may be its effect on GLUT2 transporter in beta cells. It has also been shown that the GLUT2 expression in hepatocytes has an important role in glucose homeostasis (13). Our present results for the first time showed that the Glut2 gene expression in the liver was increased in alloxan-induced diabetic mice. According to this result one may suggest that alloxan also affects expression of GLUT2 transporters in hepatocytes at the mRNA level. This change may be a homeostatic response to the increased levels of glucose in diabetic mice, which may finally be important for transportation of glucose from blood to hepatocytes. The present results also showed that the Glut2 gene expression was decreased in the diabetic group that received the nettle extract. It is possible that the decrease in the Glut2 gene expression is an indirect consequence of the nettle extract after the decrease of blood glucose levels. Therefore, the nettle extract may control increased levels of blood glucose by affecting pancreatic beta cells and subsequently insulin secretion. Other investigators have also reported that the extract of stinging nettle leaves induces insulin secretion in diabetic rats (5, 17). However, we did not measure insulin levels in plasma and it is not clear if insulin secretion was affected in mice treated with the nettle extract in the present experiments. In summary, according to the present results it is possible that for GLUT2 transporter in the liver of mice to be affected by increased levels of glucose in diabetic mice, while the ethanolic extract of nettle leaves either directly or indirectly prevents its expression. Taken together according to the present study results, GLUT2 expression in the liver is associated with diabetes and may play a role in controlling blood glucose levels in diabetic animals. Finally, there is more hope that nettle can be used as a medicinal herb supplement to control high blood glucose levels in diabetes. The authors would like to thank Mr. Zanyar Karmai for his assistance with the animal treatments. Authors’ Contributions: Study concept and design: Shamseddin Ahmadi and Masoud Haidarizadeh. Acquisition of data: Himen Awliaei. Analysis and interpretation of data: Shamseddin Ahmadi. Drafting of the manuscript: Shamseddin Ahmadi, Masoud Haidarizadeh and Jalal Rostamzadeh. Critical revision of the manuscript for important intellectual content: Shamseddin Ahmadi. Statistical analysis: Shamseddin Ahmadi. Administrative, technical, and material support: Shamseddin Ahmadi and Masoud Haidarizadeh. Study supervision: Masoud Haidarizadeh and Shamseddin Ahmadi. Funding/Support: This study was supported by Grants from Shamseddin Ahmadi and Masoud Haidarizadeh.